Thanks for the further info...so looks like what Petrovic suggested was correct re. this and so well worth remembering. Glad that it is sorted for you. If you did submit a Support Ticket it would be a good idea to update it with this information so that Support know that you are sorted and also what it was that resolved the issue for you, and so save them some wasted effort. @Caravelle if yo have not already yo may like to check out what RustyNutz found and carry out a uninstall/reinstall of Chrome so that it resides in either C:Program Files or C:Program Files (x86)...depending on whether you are running 64bit or 32bit WIndows respectively (as suggested earlier by Petrovic). Worth a try. Many thanks for the feedback...it is all useful, and as you say some solution may work in some cases for some users awhilst not for others so having a number of alternatives that are know to have worked is always useful. So, to check if the issue could be, in your case, due to where Chrome is installed would yo ube able to check that out and let us know...and then perhaps we can ask Nic to raise this more directly with the Development Team? Await your further input on this point. Yes, for a number of things running a scan does seem to initiate a refresh or at least a transmission of other elements apart from scan information. If you issue commands from your Web Console then you will most likely find that they are executed quicker as a result of a scan. But as Petr stated in his post there should have been a silent update of WSA to v8.0.4.68 which includes what looks like a fix for this issue (see this thread for details...if you have not already). Check that you have this version and if not then initial a manual 'Check for Updates' to get it...but I suspect that you already have. Thanks for posting back with your information...it is much appreicated and most useful to the Community as a whole. If you can do a quick uninstall/reinstall and see if it helps. Please note that there are multple layers of protection so even if you set Chrome to allow your leaving your PC vunerable. You didn't try to reinstall chrome? Deny. “Denied applications” cannot view or capture protected data on the system, but can otherwise run normally. "The issue you are reporting is one we are aware of and we are working to resolve it as quickly as possible." I have a pretty stupid question for you then: How do I install Chrome in Program Files? After you've download the installer file you need, open the file and follow the instructions on the screen to complete your installation. 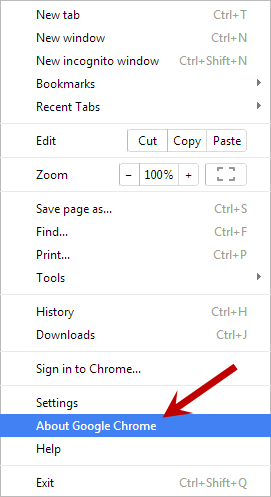 For additional help, please visit the Chrome Help Center. Also to find the version of WSA: http://www.webroot.com/En_US/SecureAnywhere/PC/WSA_PC_Help.htm#C12_MyAccount/CH11a_ViewingAccount.ht.. Thanks. As I said I knew where to find the version of Chrome. But in both cases, the traditional Help/About would have been so much more user-friendly. All the programs I write have both a Help/About and little mouseover pop-up boxes linked to everything that can possibly be clicked to explain what clicking them does and why you might want to click them. I've now raised a support ticket. if you see any Chrome files set to "Deny" here, set them to "Allow". The issue occurred with the new Chrome update. The updated files since then have been white listed, and you should no longer be experiencing this problem. If you are, please run a scan and Webroot should be notified of the change automatically, without changes to the ID shield. But setting these files from Deny to Allow should resolve this issue completely. If everything is set to Protect, you should not have issues running Chrome. I can't find anything in the online Help on this Application Protection function which explains what "Protect", "Allow" and "Deny" are supposed to do, but if the idea of Webroot is to protect me, then "Protect" sounds like the one I should be using. Can anyone explain in plain English what the difference is ? I have run a scan twice. Chrome does not work with the settings on Protect. It does if the settings are "Allow". Thank you, but what is the definition of "protected data" ? I am not being awkward, I am simply trying to get to the bottom of what is being protected here and how Webroot knows what data I want to protect and where it is. And under "Allow" why would anyone NOT want an application secured against malware ? I do not know enough about <any> application to trust it, and even if I decided to trust it that would not stop it from being infected after my decision was made. It just makes no sense to me. The odd thing is, Support don't seem to be giving any advice to install Chrome other than where it installs itself. Thank you for this information, we will forward it to the development team. Using Allow for these files shouldn't cause any issues. Thank you for your patience as we work to resolve this issue. Let us know if you need further assistance. But then they don't seem to be reading what I say. It's using "Protect" that causes the issue ! I'm still waiting for a further response from Support. If you can do a quick uninstall/reinstall and see if it helps.Is that uninstall/reinstall Chrome or Webroot or both ? I agree on the point that we should not be tinkering with where Chrome installs. Vast numbers of users have no idea how to take control of the process - they rely on it to happen automatically. Webroot has to cater for them too, and they are paying customers. Chrome continues to work with all of them [the settings] set to Protect apart from "new_chrome.exe in c:usersmichaelappdatalocalgooglechromeapplication". Setting that to "Protect" stops Chrome from going to any websites. Searching my C: drive for the word "Chrome" produces a screen full of files all in the same appdata path, apart from the shortcut on the desktop. I'm afraid it will be a while before I can do much more. This PC runs 24 hours a day collecting data, and messing about installing and uninstalling things risks losing data (particularly if the PC has to be restarted). So jobs like that tend to get done in the wee small hours when there is not much data coming in - if I can stay awake that long. A Windows update is a major pain ! HOWEVER, just for the hell of it, I reset the file mentioned above to "Protect", ran a Webroot scan (I gather from what support said earlier that this effectively reboots settings), opened a new instance of Chrome and it worked. Obviously I need to double-check and try closing down and re-opening Webroot and all instances of Chrome, and see what happens after a PC reboot later on tonight, but all I can say so far is that something appears to have happened invisibly. Does running a scan cause Webroot to update itself ? if so maybe they have fixed the problem.